With a plan jotted down in a notebook, and a map saved offline, it was going to be another day with another exciting new journey. It started with the groggy, hungry, and airsick me silently requesting my stomach to hold on to some dignity for the two-hour long journey from Seattle to San Diego. The city greeted us with a stunning night view of downtown from the air, and warmth and humidity from land. The drive to Ramada Inn was all butterflies— some remnants from the flight and new ones from anticipation. What seemed like a shady hotel, turned out to be a surprisingly comfortable weekend home. We were away from all the rain in Seattle only to find it raining in San Diego on our first morning there. Not letting it dampen our spirits, we set off to Perry's Cafe, a famous local restaurant, for some breakfast. Off we went to Old Town San Diego State Historic Park, one of the most spectacular places to see in the city. Loaded with Spanish culture right from food and artefacts to songs and dances, this place is a must visit if you ever set foot in America’s Finest City. After shying away from dancing at a 'country-dance for dummies' setup, we walked around goofing with the pots and masks, picking out some ornate key-holders, fridge magnets, and handmade painted tiles to keep the town-vibe going. Aplenty with souvenirs to take home both in kind and in memory, this old town really takes a cosy spot in your heart. Trotting off from the Old Town, we drove on to Seaport Village. 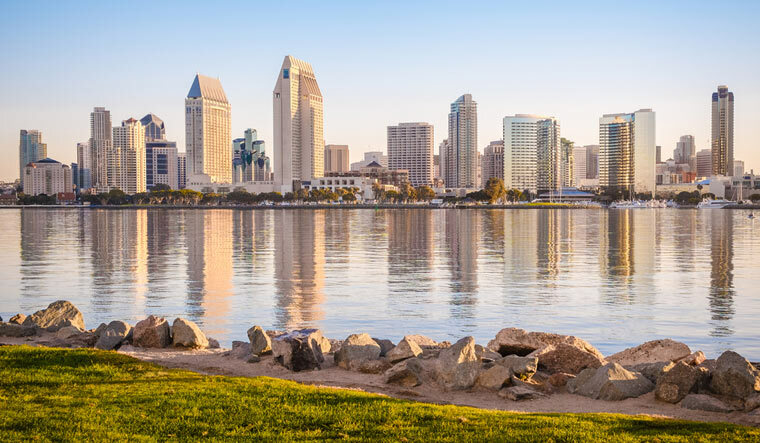 With a magic show, some cheesy pretzels, and a splendid sunset by the sea, Seaport Village brings a bit of the Old Town charm right to the heart of downtown San Diego. While kids enjoy the magic show, adults take a stroll to the ice-cream stalls, and lovestruck couples sit for a portrait caricature with the famous Keith Osborn. With a rustic vegan dinner of buffalo cauliflower and philly cheese sandwich at Grains, the first day came to an end. Now, what's a visit to San Diego without visiting at least one beach. Having meticulously planned beach-hopping with seven beautiful beaches, we packed our bags and set off to our first stop at Torrey Pines State Beach, located north of La Jolla. After a bit of contemplation about hiking, we decided not to so we could cover more beaches. Climbing onto the railing and down some rocks, we let our feet sink into the velvety sands. With only five other people around, we enjoyed the peace and quiet of having the place almost only to ourselves, walking along the never-ending coast for over an hour. We moved on to Solana Beach next. 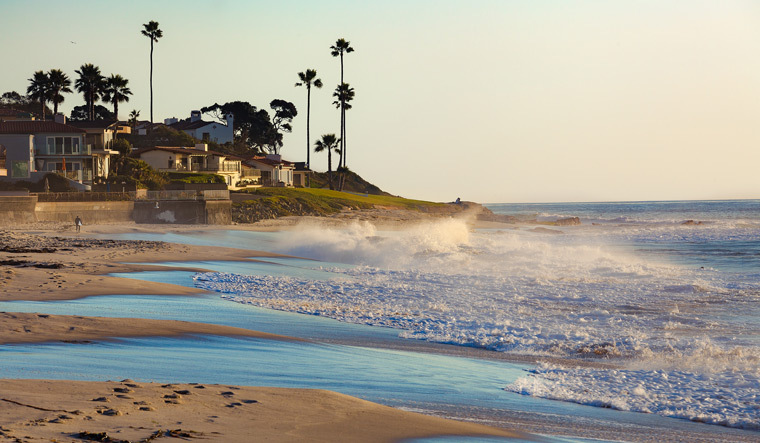 With beautiful houses lined up on the steep cliffs along the shore, this picture-perfect beach is yet another beauty. Picking up pebbles, watching gulls circle the sea to prey, contrails whizzing past drawing perfect white lines in the clear blue sky, we lost track of time walking along this cliffy coast. Losing track of time also means forgetting lunch. All the walking on sands got our stomachs gurgling and off we drove to Native Cafe, a vegan Californian restaurant to devour some native nachos with guac and crispy avocado wrap, and downed it with some sugar-free iced tea. With a happy tummy, we reached the famed La Jolla Caves and Coves. With thousands of birds resting on the rocks and hundreds taking turns soaring in the sky, competing with the contrails, this beach is a sight to behold. And, as if this just wasn't enough, we were in for a surprise when we stepped into a gift shop. What if I told you that for $10, you could walk into an underground tunnel that takes you right inside of one of the coves! To climb down through a cold cave, look at the wild sea crashing against rocks, at men and women kayaking their way through one coast to another while standing on the creaky floorboards of an old viewing deck makes for a dreamlike experience. Wanting to go stay in the cove, we walked out only to hear the exciting barks of the sea lions. A quick walk along the sidewalk above the coast and we spotted a few sea lions basking lazily in the afternoon sun, alongside some pelicans resting with their fresh catch. With a heavy heart knowing well we can no more cover the remaining four beaches (out of the seven shortlisted), we set off to the last beach. To cheer ourselves up, we chose the Ocean Beach aka Dog Beach. Right on time for sunset, we caught all furry friends happily playing fetch with their humans, resting after a long relaxing swim in the ocean, and watching the sun set with as much delight as their human counterparts. In what was one of the most bewitching of sunsets I've ever witnessed, I kissed San Diego a sandy goodbye with a silent vow to return and visit more of its charming beaches.